Brumby Christine as she appeared when taken off her soft coastal habitat (top two photos) and after three months in hard substrate desert terrain (bottom two photos), as part of an experimental switch between herds in Australia. Her hoof wear was 3x that of another mare and she lost considerable condition (weight) during the period. Researchers decided to remove her from the experiment even though her feet, as shown, seemed markedly more healthy and robust by natural hoofcare parameters but welfare was of equal concern. The Australian Brumby Research Unit has completed an experimental transfer of horses between different terrains, over 1000 miles apart. The results were recently announced after massive amounts of data, including hoof growth vs. wear measurements, were compiled. The purpose of the switch was for scientists to observe and document the transition that horses go through when environmental conditions change. When the end of the Fifth International Equine Conference on Laminitis and Diseases of the Foot comes, attendees might remember proportionately less of what they heard...and more of what they saw. The heightened visual aspect of the exciting biennial conference, which will be held November 6-8 in West Palm Beach, Florida, may lie in the technology side of things, but the impact will be an eyeful that everyone can appreciate. Leave it to Dr. Chris Pollitt (photo inset at left), assistant director of the conference, to bring the latest and greatest technology to the conference and to enhance his presentations. The new software is called MIMICS; it is made by a Belgian company called Materialise NV. In a nutshell, MIMICS converts CT scans into three-dimensional forms. I've also seen it used to model a nasal cavity for a surgery case at Cornell's vet school, and for a comparative study of the soft tissue structures of equine feet at Auburn University. Dr. Pollitt says that MIMICS software is used extensively for human skeletal reconstruction surgery and prosthetic implant design and simulation. "Suddenly I can 'see' an individual horse’s foot from all angles and can virtually dissect it on the computer monitor," Dr Pollitt wrote in the Proceedings. 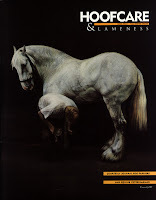 MIMICS was introduced to Dr Pollitt and to the world of laminitis by British hoof anatomy researcher Dr Simon Collins. Dr Collins will be in Palm Beach to explain how he uses computer modeling in his work at the Animal Health Trust, where he collaborates with lameness experts Drs Rachel Murray and Sue Dyson. His images will be dazzling. Dr Pollitt wrote in his introductory essay in the Proceedings, "Analyses of feet with chronic laminitis clearly show that distorted tubular hoof growth, lamellar wedge formation and solar loading of the distal phalanx are relentlessly destructive to bone. It behooves laminitis caregivers to understand the unmitigated, severe chronic process and develop proactive, early intervention strategies that will measurably arrest the process. 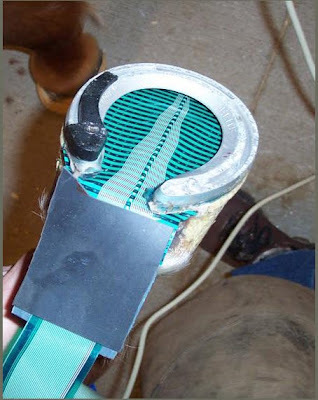 MIMICS in the hands of laminitis scientists will aid this process." 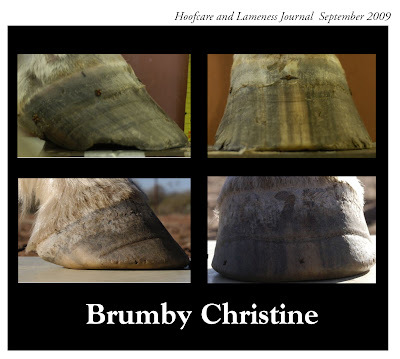 Does anyone besides me see great irony in the way that Dr Pollitt over the years has created stunning visual images of the terribly destructive disease of laminitis? The quality of his images is always worthy of Scientific American or National Geographic and yet the subject is the disease we all dread. Thanks to his artistic eye we all know what laminitis looks like, even though it's the disease we'd most like to see wiped off the equine map. NOTE: The deadline for registration for the conference has been pushed back to September 28th, since the mail has been so slow in getting the brochures and registration forms to everyone. 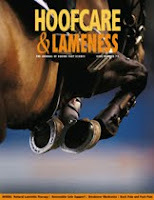 Brochures were sent to all subscribers to Hoofcare and Lameness Journal. Also, a reduced rate for two-person registrations has been added. Visit www.laminitisconference.com for more information. Credit: Individual cover images were created by Dr. Simon Collins of the Animal Health Trust in Newmarket, England using MIMICS software, and are used with permission; they illustrate pathology on the “Bronski” chronic laminitis case studied by Dr. Chris Pollitt at the Australian Equine Laminitis Research Unit in 2009. 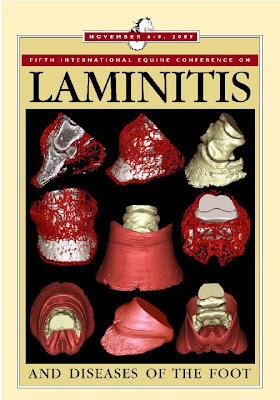 Cover montage and design by Fran Jurga will be published with Proceedings of the Fifth International Equine Conference on Laminitis and Diseases of the Foot in West Palm Beach, Florida November 6-8, 2009. Wherever you are today, you are probably a long way from Stanley Vasques. But we all share an interest in horse hooves and their care. The only difference between most of us and him is that Stanley will wake up this morning and go to work in one of the most beautiful places in the world. Stanley has been shoeing horses on the Hawaiian island of Kauai for more than 40 years. An article about him was published in the island newspaper, and I thought you might like to get to know Stanley and see a little bit of his world. Click here to read an article about someone who will wake up in paradise this morning and go out and shoe some horses. A last-minute addition to the 2009 NEAEP conference program is farrier Patrick Reilly from the University of Pennsylvania's New Bolton Center. 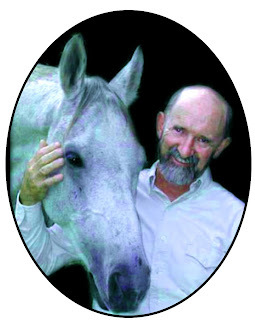 Pat is filling in for farrier David Farley; both Dave and Pat are on the board of the new organization, which has both farriers and veterinarians among its members. Patrick's lectures will include interesting studies and observations of hoof balance. In the video clip above, you will see that he has been documenting comparative solar forces on the hoof during athletic activities. This video clip shows the extended trot, which will be compared to a working trot in both a straight line as well as on a 20-meter circle. Pat also has some interesting measurements of the solar forces during jumping, and a comparison of differing density rim pads during jumping. Patrick's videos and the use of pressure-sensitive data collection media give him some opportunities to make observations that bring up plenty of questions. For example, the same horse might land toe first in one gait (such as the extended trot), but land heel first in the regular trot. Also, a horse might land laterally on one footing, but lands evenly with the same trim on another. The rider in the video is Patrick's wife, Karen; the flashy horse is her own; they just won a national young horse title last month. Congratulations! To read more about the NEAEP organization, click here. To see the foot symposium program and find out about registration, click here. Hoofcare@NEAEP: See You in Connecticut! Don't call the office this week. 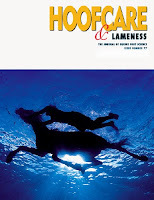 Hoofcare and Lameness will be on location at the first-ever conference of the Northeast Association of Equine Practitioners (NEAEP) in Ledyard, Connecticut. The new NEAEP organization is kicking off its public persona with a double-barreled lecture series from Wednesday through Friday. One lecture hall is podiatry only, while the other covers a range of veterinary topics, including equine sportsmedicine. Chances are, you'll find me in the podiatry lectures. The NEAEP has brought together a great group of speakers--including Robin Dabareiner, Melissa Fagerlin, Ian McKinlay, Scott Morrison, Scott Pleasant and Patrick Reilly--and filled a trade show with exhibitors. I will try to keep the blog updated from Connecticut, but if you are planning to attend--and I hope you are--please stop by the Hoofcare booth in the trade show and say hello! Registration will be available on site; details are at www.neaep.net. See you there! PS I chose this nice old illustration as our company's booth logo for this event because it is so old. It dates back to a time when farriery was veterinary medicine, and the art of bandaging a horse was an example of one of the many arts of farriery. NEAEP is an organization comprised of both veterinarians and farriers (and other horse health professionals) and I am looking forward to working with this organization for many years to come! 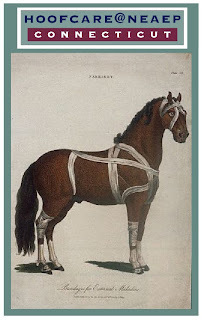 Farriery Forensics: Who Shod the Wall Street Bomber's Horse? 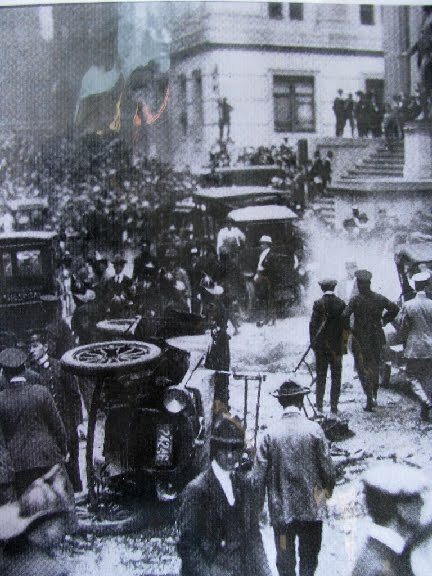 The scene on Wall Street in 1920 after a wagonload of explosives became a horse-drawn bomb in front of the New York Stock Exchange. When the 9/11 tragedy happened in 2001, few people knew that it was not the first terrorist attack in lower Manhattan on a September day. Anarchists had tried it way back in 1920, and the only clue detectives had to go on in that case was a horseshoe that survived the blast. This is the story of that horseshoe. Laminitis Prevention: Is Current Body Condition Scoring Irrelevant for Ponies? 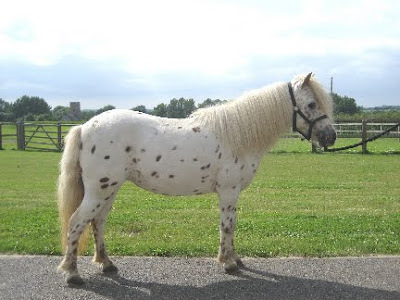 A 9.2 hand, 12-year-old spotted pony named Firefly suffered from overgrown feet and laminitis in England in April 2007. She couldn't walk properly, but her owner refused to have her cared for, nor would she sign the pony over to the World Horse Welfare. A court case ensued and the owner lost her right to own horses for two years. Here's Firefly in September 2007, on her way to full recovery and adoption to a new home. The research project funded by WHW at the University of Liverpool suggests that it is difficult to assign an objective body condition score to ponies using the system designed for larger horses. Researchers at the department of clinical science at Britain's University of Liverpool, with support from the World Horse Welfare charity, presented new research at the annual convention of the British Equine Veterinary Association(BEVA) last week. The question: how accurate is conventional equine body condition scoring for weight loss management when the equine being evaluated is an overweight pony? The study, entitled Managed Weight Loss in Obese Ponies: Evaluating Weight Change, Health and Welfare, involved five mature, overweight or obese ponies and aimed to restrict their feed intake (on a dry matter basis) to 1% of body weight of a chaff-based complete diet for 12 weeks. During this time the ponies' weight change, health parameters and behavior were monitored. All ponies remained healthy throughout the whole trial and an appropriate and safe rate of weight loss was achieved. Even in this well-managed study, the feeding activity of the dieting ponies was decreased by 74 percent compared to ad libitum intake, highlighting the need for a practical feeding system that is both effective at managing weight loss but is sensitive to behavioral needs. The WALTHAM® Equine Studies group was closely involved with this study as it has been with other groundbreaking work on equine obesity, such as showing that an obese body condition score was associated with increased insulin resistance back in 2003, and developing the cresty neck scoring system. In response to the study, the research group is in the process of developing a new condition scoring system designed specifically for ponies. 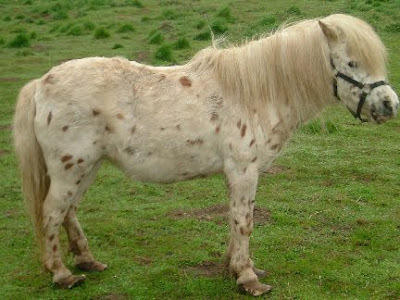 “This will involve validating the relationship between actual measurements of body fatness and the external appearance of the pony,” said Alex Dugdale, lead researcher for the study at Liverpool University. Note: information provided by Spillers was used in the preparation of this blog post. Jason Wilson-Maki is the first resident farrier at Texas A&M University College of Veterinary Medicine's Large Animal Hospital. The following article is provided by Angela Clendenin of Texas A&M University. I don't think I know Jason Wilson-Maki, but wish him the best of luck in his new position and congratulate A&M for taking the important step of hiring a full-time farrier. Photographs were also provided by A&M. 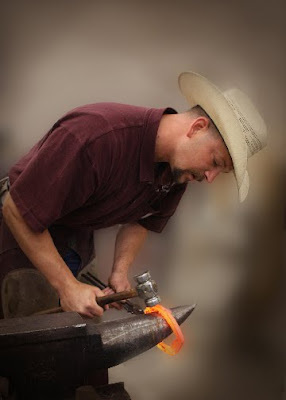 COLLEGE STATION, TX –A certain specialization that is often overlooked or unknown by many people today is that of a farrier. A farrier’s job is to provide shoes for horses, and to work on their hoof problems. The Texas A&M College of Veterinary Medicine & Biomedical Sciences does a lot of work on lame horses, and a big part of treatment for horses’ hooves often requires therapeutic shoeing, and a specialist who knows what to do. One year ago the faculty decided to do more towards pursuing a full time farrier to provide a better resource for our clients as well as a better teaching and learning environment for professional veterinary students. A native of Ohio and a 1997 graduate of the Heartland Horseshoeing School, Jason was qualified for the job because of his previous experience and teaching. He also has a double certification in the American Farrier’s Association and the Farrier’s Guild (Guild of Professional Farriers). He showed great enthusiasm about horses and teaching during his interview and began work at the Texas A&M College of Veterinary Medicine during October of 2008. Wilson-Maki feels that one of the greatest benefits of working as a farrier at a vet hospital, as opposed to being self-employed, is that working with so many veterinarians eliminates the guesswork, and is of greater benefit to the horses. 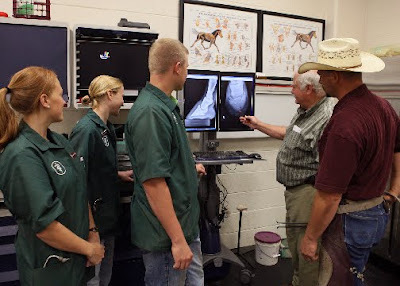 Since such a huge part of an equine veterinarian’s career has to do with providing the physical skills needed to handle problematic hooves, Wilson-Maki’s expertise has taken the veterinary medical students’ education to the next level. Jason Maki and Dr. Kent Carter (far right) with Texas A&M vet students. From enhancing veterinary medical education to providing value added service for clients, the farrier service at the veterinary medical teaching hospital has given the clinicians at the CVM another tool for helping their patients. Farrier Vane, originally uploaded by Dave Angood. Weathervanes, that is. They are one of the best ways to make a statement. A silhouette against the sky can be seen from afar and a good blacksmith can create a work of art to go atop a barn's cupola, a vet clinic, or a mobile home. Or a car dealership, clam shack or tipi. It takes the observer's eye up to the sky and there's something uplifting about that, it more ways than one. I just wish it wasn't so hard to get a good photo of a weathervane! It seems like there are always power lines or something in the way, or I can't get a good angle from the ground. This is my new favorite weathervane, captured on film by Dave Angood, who tells me he found it atop an old barn inside some fortress-like gates near Swaffham in Norfolk, England. He allowed me to share it with Hoof Blog readers. I kept staring at it for the longest time this morning. It reminds me of the beautiful weathervanes made by a farrier and heavy horse expert named Richard Gowing in England. If Richard didn't make it, surely his past work helped inspire it. Our friend the late Edward Martin from Scotland made beautiful weathervanes too. Weathervanes carry some responsibility, of course. They have to be aligned with the earth. In our little seaside village, my salty old neighbor died and left a provision in his will that money from his estate be used to get steeplejacks to come and re-orient the weathervane on top of the church which, over the years, have drifted out of alignment. It really bothered him. He saw the vane as a tool to check the wind as he drove toward the harbor each morning rather than the beautiful ornament on the church that the rest of us saw. What--and where--is your favorite weathervane? Thanks to Dave Angood for his hard work in getting such a good shot of this beautiful weathervane. Dave's trying to find out more about it and I'll add more details if he reports back. 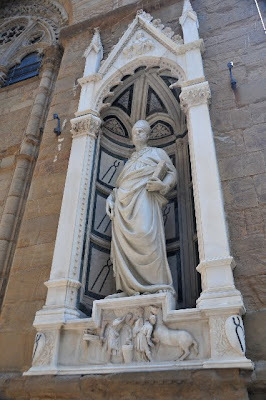 British Columbia veterinarian Geoff Gaunt was strolling down the narrow streets of Florence, Italy on his summer vacation when he looked up...and smiled. He snapped a photo for the farriers back home, and I'm sharing it with you all, too. Take a really close look at this "shoe". What looks at first glance like a Natural Balance shoe is actually a urethane hoof application created on the foot by injecting Vettec Adhere material into a mold. Vettec Superfast is sometimes also used, but Derek said that in this particular shoe, Adhere made the shoe more flexible. Here's the ground surface of a six-degree short-heart bar, made for a horse with a fractured navicular bone. 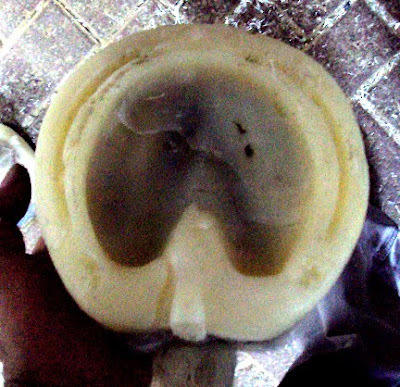 A new shoeing technique developed in Dubai by South African farrier Derek Poupard is offered for your comments. In addition to the photos above, we have a short video showing how the mold is applied and the material is inserted, and the removal of the model to reveal a "shoe", if you want to call it that. "This is so new, I only put my first one on 4 months ago, and after doing hundreds I now feel it is time to expose it," Derek wrote in an email. "I have only shown it to a handful of farriers here and right from the word go they embraced it and it is very rewarding to see their response as they peel of a mold seeing the perfect shoe. They all describe it as a revelation and every time they use it, it gives them the same feeling over and over again." This has been a big year for plastic and composite horseshoes. First Curlin won the great classics of his four-year-old career last fall wearing square-toed Polyflex shoes of polyurethane. Then Steffen Peters and Ravel won the World Cup of dressage wearing plastic Eponashoes. 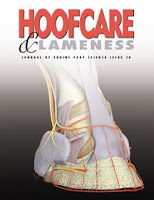 This week, the venerable Horse and Hound news magazine from London carries a feature article touting the popularity of plastic shoes, especially those designed by our friend, the clever Andrew Poynton, who has expanded his moldable Imprint therapeutic plastic heartbars into sporty new models for competition horses. And now we have the possibility of design-it-yourself hoof molds to make not shoes, exactly, but something else, a hybrid lighter and perhaps more cohesive with the foot than a separate shoe attached by nails would be. While steel and nails have their advantages too, this new technique may find a niche of its own, or become a platform for inventors or farriers and veterinarians faced with challenging hoof injuries or deformities. This second video was made a while ago by a Dubai television station that visited the royal stables where Derek works. It's a nice view into the facility and shows Derek's previous traditional use of glue-on shoes on a Thoroughbred racehorse. Eventually, Derek's molds will be available for sale, I'm sure, but in the meantime, the floor is open for comments. He's a world away from almost all of us and would like to hear from you, I'm sure. Much more information is available at www.quixshoe.com. Some American readers may remember Derek from his time spent living and shoeing in Virginia. He has been featured in Hoofcare and Lameness Journal in the past but when he left the USA several years ago, we lost track of him. A royal farrier shop in Dubai is an interesting place for him to be found. New shoes continue to come on the market or be passed around as prototypes. This process is quite unique, though, and while it seems cumbersome and awkward at this stage, it is sure to improve and become more streamlined. Rachel Alexandra: Preparing to Make History in Tomorrow's Woodward Stakes, originally uploaded by Rock and Racehorses. The go-go girl herself takes to the track at Saratoga on Saturday. Miracle filly Rachel Alexandra skipped the Travers Stakes for three-year-olds in order to challenge older males in the shorter mile-and-an-eighth Grade 1 Woodward Stakes. Expect Saratoga to be the site of the biggest traffic jam in New York State since Woodstock. Really. Since the race is not televised, the only way to witness this historic event is to Be There. My guess is that there's a pool somewhere on what the gate attendance will be. Perfect weather is forecast. Will someone who has TVG or HRTV or OTB call me and hold the phone so I can hear Tom Durkin call the race? I'd like to hear history firsthand, even if I can't see it. Ace photographer Sarah K. Andrew of Rock and Racehorses just uploaded this nice shot of Rachel leaning into her bath sponge so I thought I would share it with you all. Thanks, Sarah, for the perfect timing and the beautiful photo. Win or lose, Rachel Alexandra has made this an exciting summer. Right about now, she's camped out in the detention barn so she knows something is up. What is up is that New York and the nation has fallen in love with this horse and what they think she can do, who they think she is, and the time is just exactly right. I don't know if this will be her last race or not but with each and every race, work, and schooling session she went through at Saratoga, I marveled that she's been my good news story of the year. And I want her to stay that way. I had an idea for this blog post: Everyone turn the sound off when you watch this video, and then you won't be influenced by the location. Because for nine minutes and thirty seconds, this video takes you into a universal setting. This shoeing forge could be in Colorado or Sweden or Turkey or Japan or New Zealand, with few changes. It's a pretty universal scene. However, the sound is very nicely recorded and adds a lot; after a while, the apprentice's voice comes on and you'll hear what it's like to train as a second-year apprentice farrier in remote Donegal, on the northwestern edge of Ireland. I play a lot of games when I watch farrier videos (and I watch a lot of them). I love to watch the background activity (and give bonus points for multiple dogs) and in this case, the shoe pile jumps out of the background and dominates the whole forge. Obviously they aren't worried about earthquakes in Donegal or else John and Heather will be buried in old shoes some day. A game I like to play with non-US videos is to try to pick out the countries where tools and clothing and shop decor were made. In this video we see Kevin Keegan's ubiquitous Hoof Jack--is there a country on earth that the Hoof Jack hasn't conquered? I'm staring at one in my office right now as I write this. Readers: send in photos of your Hoof Jacks in a native setting showing what it's like in your part of the world where you live and work. Just make sure the Hoof Jack is in the photo somewhere. I'll post them on the blog. I wondered where the loop knife came from: Canada? Australia? Montana? Germany? and John's apron has a made-in-the-USA look to it. The "w" on the shoes is the forge is a giveaway that they are by Werkman and from Holland. That's just a start, you can take it from there. Many thanks to the gentle director and editor who refrained from a voiceover narration, intro music and splashy graphics. They had the good sense to just let this scene speak for itself so those of us who know what to listen and look for, can. And I hope you will. It's just ten minutes out there in the farrier universe.